A Slice of Life: I just wanna have fun! 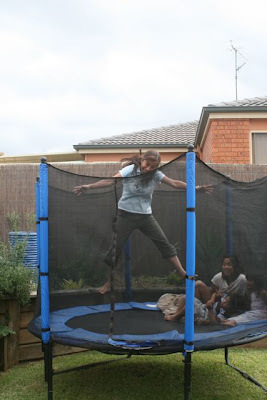 Hahaha, it’s me just havin’ fun while jumping at my sister’s trampoline at their backyard. This is where I play with Bianca and Braiden at times and it was actually a lot of fun and it makes me feel like a kid while jumping up and down there. The nice thing about their trampoline is that is has a net so that no one will not accidentally fall when they made a wrong jump. Aside from that we also play basketball, ride the seesaw and a lot more.